The extension of the KCP aims to promote unity between the new extension and the KCP building, through the definition of a porch that embraces the two buildings and generates a new global image. The new building defines a cloister as a public square. The exhibition area is located on the first floor, connected to the existing building, leaving the ground floor clear and permeable. The general strategy of the project is essentially based on the unity of all spaces and at the same time on the diversification of the proposals atmospheres. 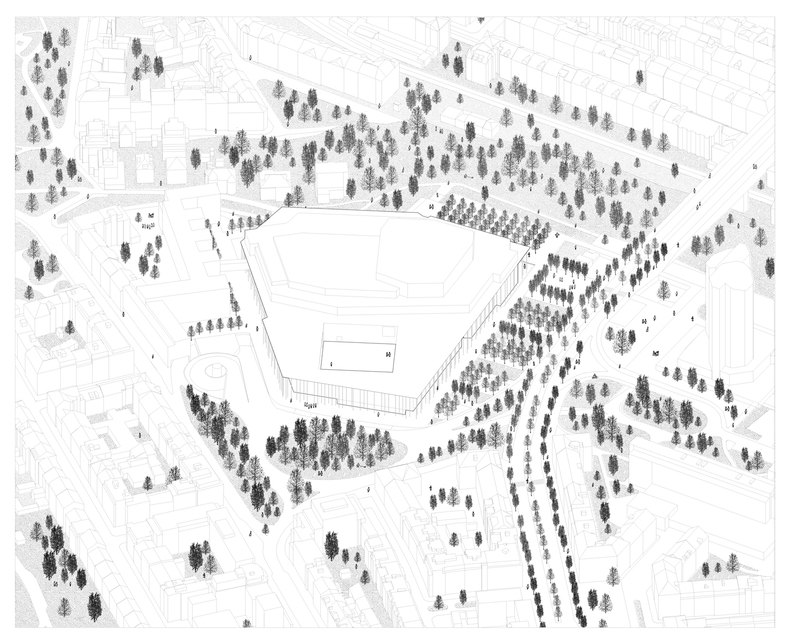 The KCP extension proposal is an opportunity not only for the revitalisation of the surrounding area but also a tool that promote the urban transformation of the Nusle neighbourhood. The first action is to promote unity between the new extension and the KCP building in order to emphasize the importance of this building in terms of urban value. By adopting a strategy that highlight the KCP as an organizer element around which gravitate the whole urban area, through the definition of a porch that embraces the two buildings and generates a new public space. 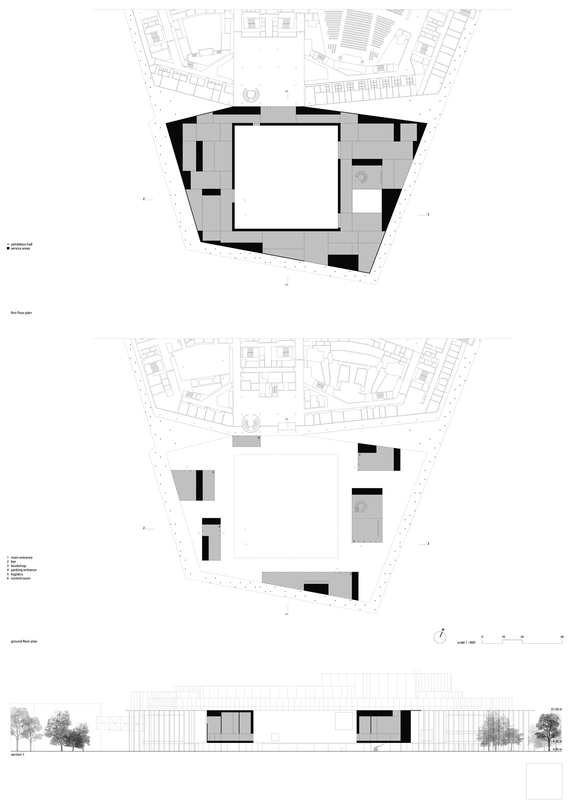 In addition the introduction of a public square in the core of the building complex contributes to generate an urban centre aggregation that increase its centrality. The second action aims to create a strong connection through new public spaces and the Nusle neighbourhood. By the transformation of the Prague Magistrála road into a city boulevard and the definition of two types of public spaces: a promenade along the new boulevard and a panoramic viewpoint to the Nusle Valley. The extension of the KCP aims to promote unity between the new extension and the KCP building, through the definition of a porch that embraces the two buildings and generates a new global image. A system defined by a cover and columns surrounds with a unique gesture both buildings acting as a filter facade. The new building is placed on the south part within the area owned by KCP and defines a cloister. Its proportions reflects the ones of an urban public square, and its centrality contributes to generate an urban centre aggregation, by adding a new function to the whole complex. 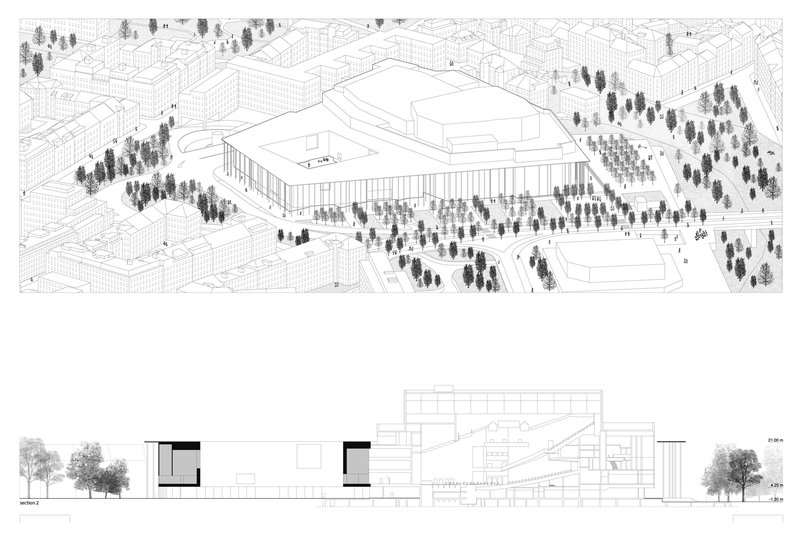 The exhibition / event area is located on the first floor, directly connected with the foyer of the existing building, leaving the ground floor clear and permeable. On the ground floor, small and transparent volumes host several functions such as: entrance, bookshop, caffè and service entrances and deliveries and vertical connections. 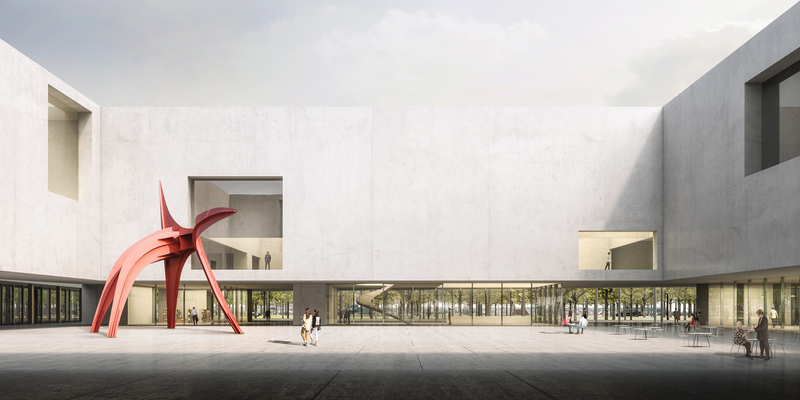 The exhibition space is organised according to an orthogonal system of large beams that divide spaces in a regular way, emphasising different hierarchies and atmospheres. This structural beam system minimises the presence of vertical structures, generating large and flexible open spaces which can be divided according to the proposed event.